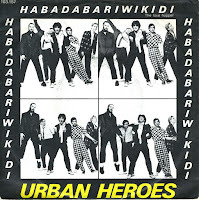 In 1981, the Dutch band Urban Heroes record and release their second album: 'The age of Urban Heroes'. The track 'Habadaba riwikidi' is released as a single and reaches number 21 in the Dutch Top 40. It remains their biggest hit. That same year, they released a live album, produced by Rinus Gerritsen from the Golden Earring. I'm not a big fan of Dutch music, but every now and again there are exceptions to this rule. I'm always happy to hear exceptions, but they've been pretty scarce recently. Things were better in the 1980's. The Urban Heroes are an example. 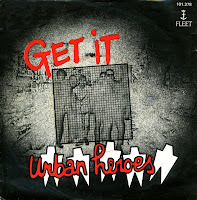 The band was formed in the late Seventies in Den Haag, and released their first single, 'Get it', in 1980. It reached the Dutch top 40, stayed in there for three weeks and reached number 32. Not a very high chart placing, but they would also reach number 32 with the next single, 'Not another world war'. Their biggest hit was 'Habadaba Riwikidi', which got to number 21 in 1981. After this, the band never reached the top 40 again. They split up, reunited, split up again and reunited again.